How Should IT Governance for Higher Education Be Organized? This is Part 2 of the IT Governance for Higher Education series of blog posts, based on the IT Governance Toolkit developed by Vantage Senior Consultant Cathy Bates for EDUCAUSE. How Should IT Governance Be Organized? There are many ways to define and organize the IT Governance function and the approach will vary from campus to campus. 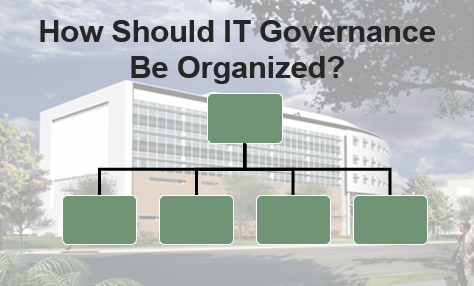 Your IT Governance model can be organized by service area, mirror existing campus governance groups or could be a hybrid of both approaches. Other factors that impact the structure include the institution size, composition of IT operations across the institution, whether IT operations are centralized or distributed (or both), hierarchical structure of the institution and institutional culture. An IT governance model and associated committees may also incorporate standards and frameworks such as COBIT, ITL or ITSM. COBIT and ITL are frameworks developed by independent professional organizations that provide centralized resources and guidance on IT Governance and other IT topics. ITSM or IT Service Management is a general term for a strategic approach to IT management. The most important thing to remember when designing your IT Governance model is that the model must fit the way your organization functions and its culture and values. Forcing an organization structure into your institution rather than taking the time to design a model that matches the way your organization works is a recipe for sub-par results. Where Can I Get Some Ideas for IT Governance? One way to get some ideas about IT Governance models is to explore how other institutions or your peers have organized and documented their IT Governance organizations. Most colleges and universities that have adopted IT Governance policies are generally transparent and publish their approach on their websites where they outline their organizational structure, describe their framework, and identify key members of each committee. You can find other examples by searching individual university websites (look for CIO or IT Group) or by doing an Internet search on IT Governance in Higher Education. What are your goals for IT Governance? What must it do that is not being done now? How should IT Governance align with your institution’s mission strategy? Do you want to address IT decision making for both centralized and distributed areas? Do you need separate decision and policies for administrative vs. academic IT? How does IT Governance relate to your organization’s budget process? What are the Key Success Factors for Organizing IT Governance? As you can see there are many different models and approaches to IT Governance but the easiest rule to remember is that the approach should fit the unique circumstances for your organization. Although the CIO is charged with leading this effort, it is critical that there be a collaborative campus effort to build the governance model to best address the current and desired state of technology for the campus. As you begin discussions with stakeholders about IT governance, it is a good idea to also launch a communication plan for the times that you will want to solicit input from and update the campus on the model as it is being developed. Part 1 – Why is IT Governance Critical for Higher Education?